(SOLD) This is an amazing example preserved like it left the factory in 1971, as it has only traveled 8,498 miles since new. It has been well maintained and garage kept. 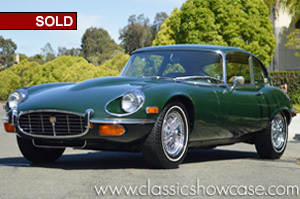 Presented in a spectacular color combination of British Racing Green with a biscuit interior, it still sits upon its original tires, has 3 sets of keys, includes invoices of work performed, has the original books, and the warranty book with protecto plate in the original Jaguar pouch. It has the desirable small chrome front and rear over riders with a well preserved interior. It comes complete with a four speed, A/C, chrome wire wheels, jack, and sporting its original paint, which is virtually perfect. 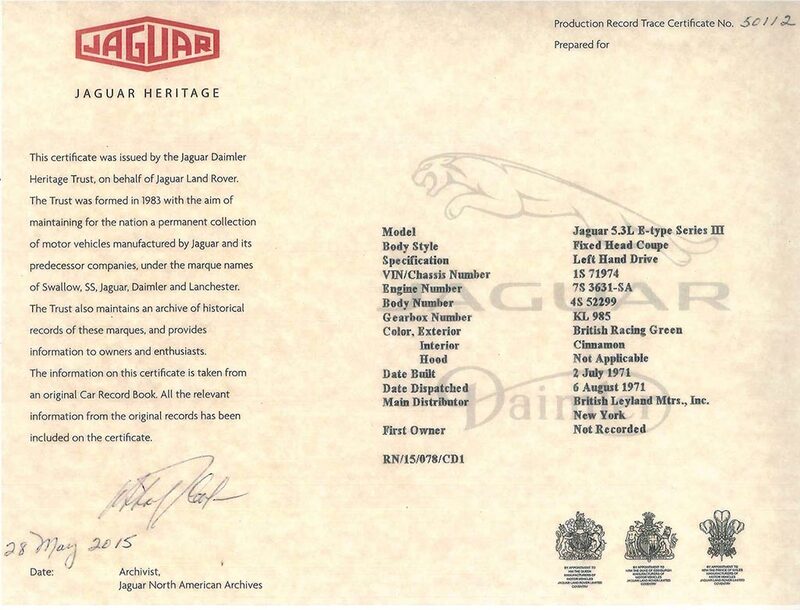 This is for the Jaguar collector that demands originality and wants to add a very desirable, and highly collectible 1st year Series III V12 to their collection. It can be shown in the preservation category as it looks, and even smells, wonderful. The E-Type Series 3 was introduced in 1971, with a new 5.3 L twelve-cylinder Jaguar V12 engine, uprated brakes and standard power steering. The short wheelbase FHC body style was discontinued and the V12 was available only as a convertible and 2+2 coupé. The convertible used the longer-wheelbase 2+2 floorplan. The Series 3 is easily identifiable by the large cross-slatted front grille and flared wheel arches, and a badge on the rear that proclaims it to be a V12. Cars for the US market were fitted with large projecting rubber bumper over-riders (in 1973 these were on front, in 1974 both front and rear to meet local 5 mph (8 km/h) impact regulations, but those on European models were considerably smaller. US models also have side indicator repeats on the front wings. There were also a very limited number of six-cylinder Series 3 E-Types built. These were featured in the initial sales literature. When leaving the factory the V12 Open Two Seater and V12 2 ± 2 originally fitted Dunlop E70VR − 15 inch tires on 15 × 6K wire or solid wheels.